Up for sale is a beautiful Mk.I Austin Mini 850. This is a great looking, rust free, well maintained, Mini that is very reliable and drives extremely well. This is a long time California/Arizona car that is very solid and even has an old California "pink slip" dating back to 1982. 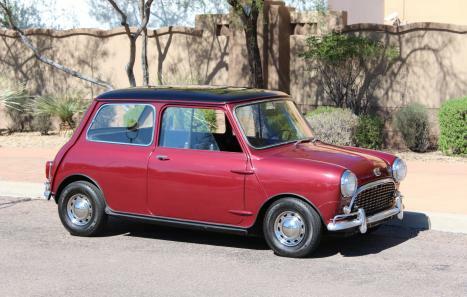 This Mini is very original, wearing an older repaint and a very nice interior. This Austin Mini is finished in maroon with a black top It has been well cared for and is rust free with no sign of ever having accident damage. The car appears to retain it's original floor pans and other metal. It wears an older repaint and still shows very well. The car has been driven and enjoyed so there are a few minor blemishes in the paint. A couple paint chips have been touched up and are shown in the pictures. All of the panel gaps line up as they should. The windshield does have some very minor pitting and the rest of the glass is in great shape with no pitting or cracks. All of the chrome and bright work is in good condition with the bumpers showing some age. A set of Kumho tires were recently installed. Overall, the exterior of this Mini is in good condition. The beautiful black interior is in very good condition and shows very nicely. The seats are very supportive and feel great to sit in. The rubber flooring is in excellent condition with very little signs of wear and no tearing, splitting, or cracking. The door panels are in like new condition and show no wear. The headliner is in good condition. The dash and dash trim is in very good shape. The dashboard features the correct Smiths triple center binnacle gauges with all gauges working. All of the lights and wipers work as they should. The steering column mounted turn signal indicator switch even flashed green when in use. The sliding side windows operate as they should. 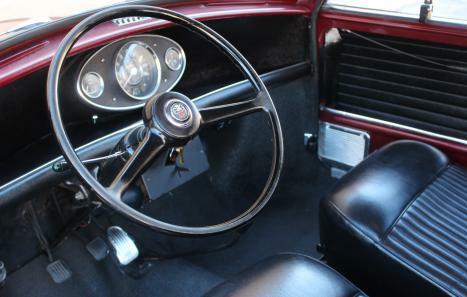 The interior is completed with a factory correct steering wheel that feels great in your hands. The interior of this car is in superb condition and is a great place to spend the weekend driving up your favorite twisty roads! Mechanically the car is as good as it looks and runs like a top. 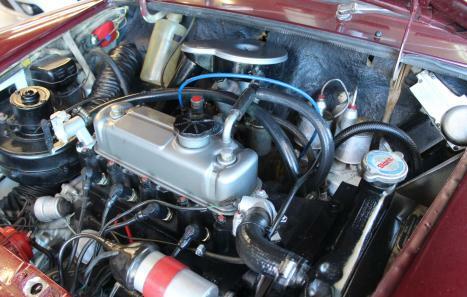 The original 850cc motor has upgraded to a 998cc unit and has great oil pressure. The inline 4 engine has plenty of power to accelerate this lightweight car with ease and sounds amazing. As with most British cars, this mini does drip a couple drops of oil. 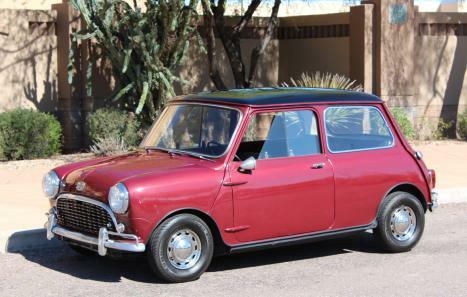 This mini runs cool in the Arizona heat. The engine is mated to a 4speed transmission that shifts great through all the gears. The suspension is very tight and the car handles like it is on rails. The steering is nice and tight. The brakes have been completely rebuilt and the car stops with ease. This is a great running and driving car that never skips a beat. Overall, this car is mechanically sound and ready to be driven.